Today was the start of the Fall trolling season on Vänern. I launched the boat on last Friday,fished only a bit in some bad weather. 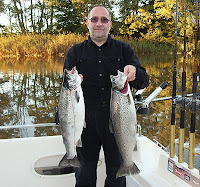 Today the weather was much better, after a frosty night, sunshine and warm and the fish were behaving well. I caught 1 trout of 5kg, 1 salmon of 4kg, as well as 1 wild salmon which was released and lost 1 trout, which was foul hooked.